Alfalfa sprouts come from the alfalfa plant, specifically when the shoots are harvested before they are fully-grown. Their small size means they have a concentrated amount of whatever nutrients they contain, according to HealthyEating.SFGate.com. The vegetable is low in calories and has zero fat, making it ideal for those who are watching their weight. 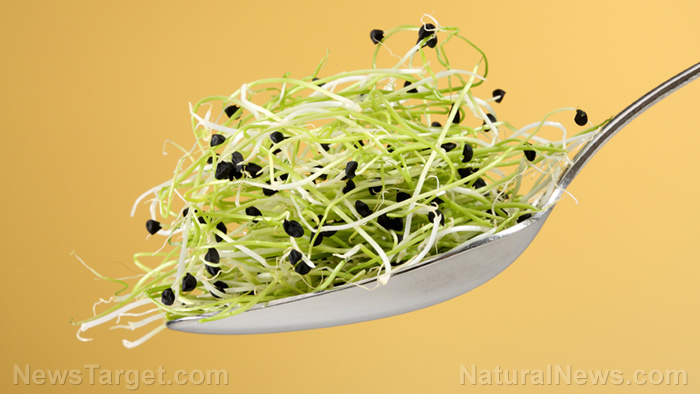 One cup of alfalfa sprouts contains only eight calories, though it also contains 1.3 grams of protein. Healthy as it is, the vegetable has been associated with salmonella and E.coli outbreaks in the past, so it is important to handle alfalfa with care, rinsing them thoroughly through running water and draining them before consuming. This will ensure that you reap the health benefits of this tiny vegetable in full. 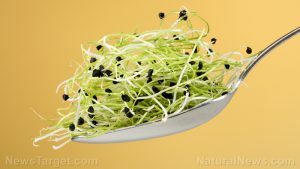 Alfalfa sprouts contain a great source of canavanine, an amino acid that is beneficial in preventing several cancers, including leukemia, pancreatic cancer, colon cancer, and fibrocystic breast tumors, according to NaturalNews.com. They also promote heart health by providing a substantial amount of saponins, a chemical compound that can help lower bad LDL cholesterol while maintaining good HDL cholesterol. Saponins also protect against atherosclerosis, which causes the hardening of the heart’s arterial walls. The saponins in alfalfa sprouts also have anti-inflammatory properties that help prevent strokes, as well as provide relief for arthritis and lower chronic inflammatory conditions. Alfalfa sprouts also boost the immune system, through the saponins, as well as a substantial amount of antioxidants, which also fight free radical damage and lower the risk for cancer and other dreaded diseases. The low calorie vegetable is a rich source of protein and fiber, making it ideal for weight loss and diabetes control. It also contains estrogen, which improves bone density and helps prevent osteoporosis. With its subtle flavor and crisp texture, the vegetable can be used in a great number of dishes. However, according to LiveStrong.com, alfalfas should not be consumed raw as there is a high risk of ingesting harmful bacteria or developing a food illness. Consuming alfalfa when cooked will ensure that any bacteria they carry is killed. They can easily be added to stir-fried dishes, soups, and stews — though it is recommended that they be added only at the very end of the cooking process, to help retain their crunch. You could also try toasting the alfalfa by placing them in the oven for a couple of minutes before using them to top off salads, sandwiches, or wraps. Alfalfa is great for heart health, lowering cholesterol levels, and preventing atherosclerosis. The vegetable has anti-inflammatory properties, reducing the risk for stroke and heart disease, as well as improving symptoms of arthritis. Alfalfa nearly rivals seaweed in its mineral content. It has amino acids and antioxidants that protect against several types of cancer. Alfalfa is a great source of protein and fiber, making it a great weight loss aid.